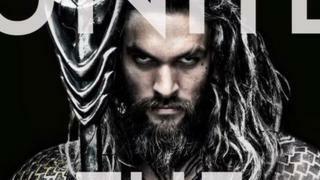 Director Zack Snyder has unveiled the first picture of actor Jason Momoa in character as Aquaman, from his forthcoming film Batman V Superman: Dawn of Justice. He tweeted the picture adding: "There is only one true King. #unitetheseven." It is thought to refer to DC Comics' seven-strong Justice League; Superman, Batman, Wonder Woman, The Flash, Green Lantern, Aquaman and Martian Manhunter. Batman V Superman is due in cinemas March 2016. Momoa - who played Khal Drago in hit series Game Of Thrones - will then appear in Snyder's two Justice League films in 2017 and 2019, as well as his own Aquaman movie in 2018. Aquaman is the ruler of the seven seas, which comic book fans have speculated could also be what Snyder's "#unitetheseven' reference means. The director kicked off the DC Comics Shared Universe films with 2013′s Man of Steel and other spin-offs are scheduled, with the Justice League films uniting the characters in a similar way to Marvel's Avengers. According to IMDB, other films planned include Suicide Squad in 2016, Wonder Woman in 2017, The Flash in 2018, Shazam in 2019, Cyborg and Green Lantern in 2020. Batman v Superman wrapped principal photography in December 2014 and will be released on 25 March next year. Snyder has previously used his Twitter feed to tease images from the movie, including Ben Affleck as Batman and the new look Batmobile. Man of Steel: a new era for Superman?